ROBERT SPINNER. The most likely parents for John Spinner of Northbourne and later of Deal, are Robert Spinner and Mary Ratclif who married in Northbourne in 1715. There is a burial in Northbourne on 24 Dec 1774 for Robert Spinner aged 90. If this is the same Robert Spinner he would have been born in 1684, making him 31 at the time of his marriage. This is a plausible age. Unfortunately, the Northbourne baptisms between 1679 and 1695 are missing or illegible. 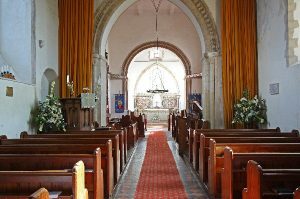 We have not found a suitable baptism elsewhere in Kent, though it may be in a parish whose early registers have not survived. There is evidence that John Spinner, who married in 1690 and had children baptised in Northbourne, came from Chillenden 3 miles west of Northbourne. A Robert Spinner was buried there in 1686. Chillenden could also be the origin of the younger Robert Spinner. John Spinner was a husbandman. It is possible that this was Robert’s occupation too. There are no Spinners in Northbourne in the 1664 Hearth Tax Assessment, which includes non-payers. This strengthens the argument that the Spinners, whom we first meet in Northbourne in the late 17th century, came from elsewhere. Northbourne is a village 3 miles east of Deal. The roots of its church date back to 618, only 21 years after St Augustine landed in Kent. The present flintstone church dates from 1120. It is dedicated to St Augustine of Canterbury. It has an unusual cruciform shape. In 1676 the population consisted of 218 Conformists, 12 Nonconformists and 0 Papists. MARY RATCLIF. We have not been able to find the baptism of Mary. The lack of other Ratclif entries in the Northbourne registers suggests that she was born elsewhere. Robert Spinner married Mary Ratclif at St Augustine, Northbourne, on 27 Oct 1715. Both were residents of Northbourne. There is also an entry for this marriage in the register for Sholden, St Nicholas, but it is in a list headed “Northborn’. Northbourne is two miles inland from Deal, while Sholden is on the northern fringe. The churches are two miles apart. Sholden is recorded as a chapel of Northbourne. Both were under the Abbey of St Augustine in Canterbury. 1732/3 Jan 8 John son of Robert and Mary was buried. He was their eldest son and was aged 14. Three years later, their last child was born and also christened John. It was common for churchwarden’s accounts to note money paid to parishioners from the rates for killing vermin which might damage the food supply. No Spinners are listed in the poll books for 1734 and 1754. Presumably the Spinners did not have the necessary property qualifications to vote. Mary lived well into middle age. Mary, wife of Robert Spinner, was buried in Northbourne on 2 May 1756. Robert Spinner was buried in Northbourne on 24 Dec 1774, aged 90.